Vermont is a state with one of the highest population of whites in America. This ratio is reflected in the university population as well, which is over 80% white. Recently, the University of Vermont has made efforts to be more accepting towards people of color by opening POC groups, running diversity education programs, and emphasizing support for POC in an endless sea of white culture. But these efforts have proven somewhat futile. Our campus has seen its share of racial conflict; ‘It’s okay to be white’ posters were strung around campus, the Black Lives Matter flag was stolen from a flagpole, and one student even made threats to shoot [the n-word] on our campus. Shop 'together Art Print' here! I’m from Connecticut originally, which has more diversity than the state I now call home. I attended public schools where most of my friends’ grew up in English Second Language (ESL) homes. In terms of race and only within the school’s walls, I was a member of the minority. But as a cisgender white female, I fit right into the University of Vermont’s (UVM) demographics. When I was first introduced to the school, I was amazed at how ‘inclusive’ and ‘welcoming’ the campus was. But, after attending classes and seeing what was actually happening on campus, I came to the realization that UVM was putting these statements forward only to attract potential students. The tension between the university and racial-activism groups on campus came to a head this past spring. No Names for Justice, a student-run racial justice organization at the University of Vermont, occupied classrooms, walked out of classes, and protested the university’s lack of racial inclusion programs. Students of color barricaded streets and held teach-ins to share their voices. The event served as a shock to the wealthy, white administrators and prospective students of the university. Shortly after the initial rally for racial equality, UVM students, both people of color and white, filled the #UVMSaidYes tag on Instagram. While new members of the next graduating class avidly posted pictures of them standing next to the iconic Catamount statue and smiling as the next chapter of their lives was starting, students affected by the issue of racial inequality on campus were posting posters from the rally, claiming that UVM’s suppression of voices of color was an act of white supremacy and poor use of educational power. The university, in response, embraced a heavy police presence at rallies and threatened to take disciplinary action against those who would continue to occupy administrative buildings. I would have never imagined this would take place in a city that is home to Bernie Sanders and the remains of the counterculture movement. In high school, I watched the story of Trayvon Martin, heard reports of Eric Garner's death, and saw the complications of Michael Brown’s shooting. When teachers taught me about racism, they suggested that racial tensions are more so an issue in the Deep South than in New England. After watching footage of students barricading Main St. in Burlington during rush hour, I would say that my teacher’s message was undeniably false. I never expected that I would be caught in the crossfire of standing behind a group of people who felt marginalized by the university system while understanding my own place as a white student. Yet, I stood in the crowd at the occupation of the Waterman Building. I chanted, ‘No Justice, No Peace.’ I rallied with my peers at an admitted students day on campus to show that racism still happens on a liberal campus. I watched queer POC and cisgender males walk around campus notifying others of what was occuring in Waterman. But, I wondered. How can I support people of color while acknowledging my own systematic advantages? By paying tuition to the university, I feel as though I’m inherently funding the behaviors that have been so harmful to POC on our campus. There’s no way to separate higher education and racism; I can’t just pay for the education and not face the moral implications. Yet, the university is regarded as one of the most progressive schools in America. We separate our compostables from our recyclables, ask people what pronouns they would prefer, and mandate that students take classes in ‘diversity.’ But injustice is still occuring. Finding a solution to centuries of systematic racism is not something that we can do overnight. Rather, it is about creating a culture that is transparent about the racial issues we have, both in our society and on our campus. Sweeping issues underneath the rug are dangerous to both the people marginalized by injustice and those who want to hold a reputation and attract prospective students. No school wants to acknowledge that they have rampant racial inequality across their campus because it’s disheartening in its entirety. However, if I knew that I was attending a university that was transparent about its past and willing to take steps to correct and prevent instances like it from happening again, I would be more than proud to call myself a Catamount. We must acknowledge our bias, privilege, and experiences without discounting the identity and subsequent experiences of each other. I cannot begin to understand the fear that POC have when they have to walk to class, surrounded by people that aren’t exactly ‘like them.’ Or the professors of color, who have to sit on boards surrounded by almost all white peers. I cannot understand, because I have systematic advantages that allow me to prosper in a society built for the success of white people. It’s not only the universities that have to be transparent, but us as individuals. We must acknowledge our bias, our privilege, and our experiences without discounting the identity and subsequent experiences of each other. As a white student, I know that I will never be able to experience what many POC have experienced on our campus, but that doesn’t mean I can’t acknowledge my privilege and stand behind those who feel they are drowning in a white majority. 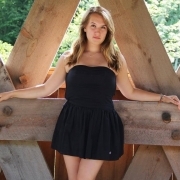 Sara is managing editor at bSmart and student at the University of Vermont. She plans to attend law school upon her graduation.